Concerns over personal privacy have been associated with Google Maps almost since its inception. Initially concerns were raised about people being able to nose around your garden using Google Maps satellite view. More recently Google Street View has proved equally controversial. The Onion however has discovered that you can escape the prying cameras of Google by moving to the Google Opt Out Village. The village is enclosed in a large metal box so residents are free from Google's satellites and Street View cars. Even if you move to the Google Opt Out Village however, there is little chance that you will escape the attentions of Google's ubiquitous Street View trike. The trike has been all over the UK, Netherlands, France and the US this summer. 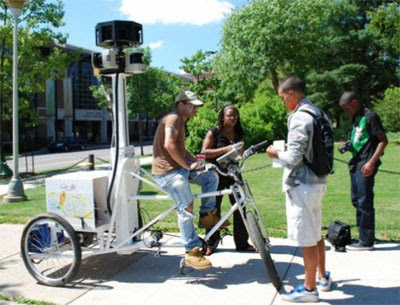 The latest sighting comes from Penn State (Google have been triking around a number of university campuses recently). The Street View car has been getting a little jealous at all the publicity that the trike has been getting lately so it decided to take things into its own hands. In an episode reminiscent of the classic Herbie films the Street View car recently decided to crash the fence at the Laguna Seca Raceway and take on the competing cars. 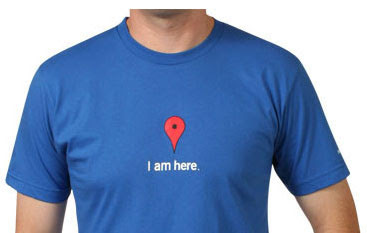 The Google Maps t-shirt is back in the Google Store. For just $15 you can buy a royal blue American Apparel 100% combed cotton shirt featuring the Google Maps pin and "I am here" text on the front, Google Maps logo on the back, and URL on the sleeve.